A 1/4″ sheet of foam is placed on the wall, providing a barrier between the sand cove and the wall, reducing corrosion to this area of the wall, extending the life of the pool. It also cushions the liner, reducing wear and the ability to puncture the liner. Prices range from $60 to $150 depending on the pool size. warranty on our foam base covers this. Washout is particularly common in slopped yards when water from the rest of the yard or the house gutters is directed toward the pool. Washout can also happen when a filter hose fails or when a liner develops a leak and can be quite extreme in the case of a liner seam split. If you are considering purchasing this material from another company, ask for a sample and be sure they are supplying the triangular cove pieces as well. There are considerable differences in the materials suppliers sell for this purpose. Because of how thick this material is small channels some times form where we seam the foam together. We warrantee this will not harm the liner and have had nothing but great feedback from customers that have gone with this option. – Gives years of a soft sturdy bottom to your pool. If the pool was properly installed the first time sand should not have to be added when the liner is changed unless there was a major liner failure. If this has happened you will know because the sand will be spread across the yard. To add 1 inch of sand in most pools requires 1 to 3 tons of sand. This requires a second truck to come out to deliver the sand and a bobcat to put the sand in the pool. If you need a sand delivery access to the back yard for the equipment is very important: 7 feet of width is needed for the bobcat. When deciding how you would like the equipment to reach the site, consider that tire marks are likely. If the ground is very soft, deep tracks may result. The homeowner is responsible for repairing any lawn damage. If this is a concern, we can plank the lawn 100Ft. for $100. To save this machining charge, homeowners have the option to move the sand themselves. Keep in mind this is 3-8 tons, plan on 2-3 hours. We need to now what type of liner you have. A Beaded or Hung liner hang from a track under the top rail. An overlap liner goes on the over the wall with the top track over the liner. Sometimes people trim the extra off so you can’t see that it is an overlap so look closely. It is not recommended that you trim off the excess because as the liner shrinks it can pull out from under the top track. 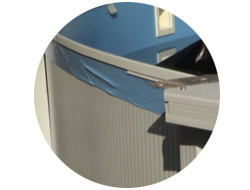 This type of liner is available in plain blue or with a printed bottom we suggest going with the printed bottom they don’t cost much more and they hide irregularities in the pool base such as settling and roots better. Originally the deck was built after the pool. It is easier to build the deck to the pool than the pool to the deck. Every effort will be made to meet the two together as close as possible, however, modifications to the deck are usually necessary. You, the customer, will be responsible for this. Another consideration is if the new pool is higher that the old pool how this will affect the deck to pool junction. 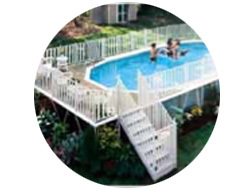 We need to know if the deck meets to the side of the pool or goes over the top of the pool. 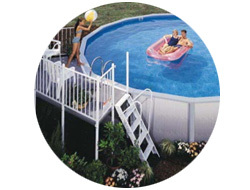 Example of a deck meeting the side of a pool as opposed to going over the top. We can give you an estimated price to level the site by how far off you think it is. If you would like a more accurate measurement, you can use following method. Mark off the pool area (paint a circle for round or mark with four stakes a rectangle the dimensions of your oval pool). Have someone step on a string were the yard is the highest (do this two feet further out from the center of the pool than the pool wall in order to compensate for the extra area we will be digging). Bring the string to the lowest part of the pool site and add two feet. Hold the string level and measure how high off the ground it is. A $1 line level will make this much more accurate. 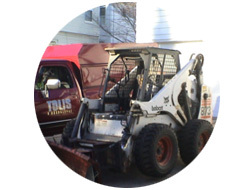 Our excavator will measure this when he arrives and the final price will be adjusted accordingly. Above ground pools come with one skimmer to supply water to the pump and one return to send the water back to the pool. To properly circulate the water in the pool you need to spin the water by pointing the return down and away from the skimmer. This will eventually work all the water into the skimmer. Unless debris floats within a few inches of the skimmer it stays in the water until it settles in the center. Putting a second return on the other side of the skimmer allows you to push the water down across the pool, off the far side and back directly into the skimmer. The second return doubles the gallons per minute the pump can move. Running a two speed pump on low speed which uses a quarter of the power you can move the same gallons per minute as a single speed pump with one return. We need to confirm your filter can handle this flow rate. Save up to $150 per year with two speed pump. A two speed on low can run on low all day keeping the pool even cleaner using half the electricity as a single speed pump running 6 to 8 hours. When we dig the pool, the sod is piled at a location marked by the customer within 50’ of the pool. If you would like, we can haul the sod away. This is charged by the load. One load removes all the sod from most pools and the majority of it from the larger ones. Please be aware that some rocks and small piles of dirt may be left behind after the pool is completed. The homeowner can most often take care of this final ‘clean-up’. If however you need us to remove all left over earth materials, we can do this for the charge of an additional load. 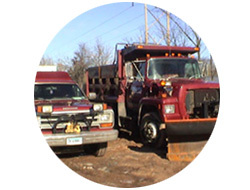 Keep in mind the price for the dump truck hauling services is the same whether we haul 8 tons or 2 wheelbarrows full. We need 48 hours notice if you would like hauling in order to arrange the schedule so that the truck arrives empty (typically it carries sand for 2 or 3 pools). If the dump truck cannot get to the pool site, the access charge to bring the sod to the street is the same as bringing the sand to the pool. Besides adding to the overall comfort of your pool, the foam pad base will also provide a layer of smooth resilient foam like no other product on the market. The foam pad base is closed cell foam that has been designed to withstand years of use. 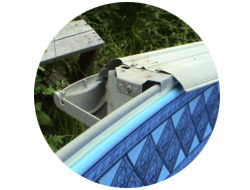 The air pockets help to keep your pool’s liner safe from objects that can destroy it, while giving the pool owner the softest and most consistent bottom. All pads are ½’’ in thickness. Also because it is a solid material it cannot wash out like other base options. The warranty on our foam base covers this. Washout is particularly common in slopped yards when water from the rest of the yard or the house gutters is directed toward the pool. Washout can also happen when a filter hose fails or when a liner develops a leak and can be quite extreme in the case of a liner seam split. If you are considering purchasing this material from another company, ask for a sample and be sure they are supplying the triangular cove pieces as well. There are considerable differences in the materials suppliers sell for this purpose. Because of how thick this material is small channels some times form where we seam the foam together. We warrantee this will not harm the liner and have had nothing but great feedback from customers that have gone with this option. • Gives years of a soft sturdy bottom to your pool. By mixing vermiculite with portland cement, it becomes an insulating concrete that can be troweled to a non-abrasive smoother finish than a sand base, adding years of life to your pool. It is flexible enough to move with the frost yet dense enough that the occurrence of footprints is rare, which is not the case with sand or clay. • We guarantee a firm, permanent base that won’t wash out. Sand and clay wash out easily. Most contractors will not cover this type of damage under their warrantees. Washout is particularly common in slopped yards when water from the rest of the yard or the house gutters is directed toward the pool. Washout can also happen when a filter hose fails or when a liner develops a leak and can be quite extreme in the case of a liner seam split. This should cause extra concern if your pool is above yours or your neighbor’s home. When a liner gets a small tear, water begins to leak near the wall of the pool. This can wash sand out from underneath the liner, causing the liner to stretch. Meanwhile, the tear gets bigger causing a larger hole in the ground. It is this kind of leak that can cause considerable damage to the area surrounding the pool. When over 50 tons of water starts to move, it can cause quite a bit of damage. • A Vermiculite pool base will control root, stone & grass intrusion much better than sand and clay. • Recently wooded areas that have heavily rooted or stony soil should give this type of base extra consideration. This base should also be considered if the pool area tends to stay wet for long periods. 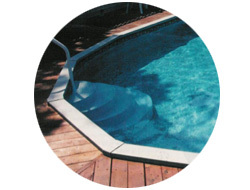 • Some types of oval pools have substructures under the liner that allow sand and clay to settle around these parts. This settling shows up as sink areas under the liner. Ask the contractors you are considering if their warrantee covers this. We guarantee that vermiculite concrete will hold its shape against this type of settling. • Liner replacement is less expensive with this type of base. Sand and clay bases have to be raked and repacked after the old liner is removed, which increases the time the job takes by up to 30%. With a vermiculite pool base, we give a $100 credit on every liner change for the life of the pool. When averaging the cost over the life of the pool, it should be no more than $20 a year for a considerably more stable foundation. Access to the back yard for the equipment is very important: 7 feet of width is needed for the bobcat and 11 feet of width for the dump truck. When deciding how you would like the equipment to reach the site, consider that tire marks are likely. If the ground is very soft, deep tracks may result. The homeowner is responsible for repairing any lawn damage. If this is a concern, we can plank the lawn for $100 per 100 feet. If you are getting a sand bottom (with planking) or the Dump truck cannot access the back yard or you would rather it did not, we can machine the sand to the pool site. This charge will be $30-$90 depending on your pool size. To save this machining charge, homeowners have the option to move the sand themselves. Keep in mind that this is 3-8 tons of sand, plan on 2-3 hours of work time. All sprinkler heads should be flagged and any heads and lines should be removed from the dig area prior to the digger’s arrival. Add 4-6 ft to the diameter of the pool to figure the dig area. Adjust remaining heads so they do not spray the pool.